Extinction has been going on for a long time: since creation itself in fact. The first man-made extinction dates back to the 17th century. It took just 60 years for the dodo to be eradicated from the island of Mauritius, and ever since Raphus cucullatus has become a byword for not just extinction but sort of obsolescence. Dead as a dodo, we say of things that are not just dead (as though that were not final enough) but sort of ‘extra-dead’, dead-plus-plus you might say in modern Brexit parlance. As the human population increased, so others declined. The last quagga — a South African zebra-like animal — died in 1878. The last wild passenger pigeon was sighted in 1901, the last Tasmanian tiger died in captivity in 1936, the last known Pinta Island tortoise, known fittingly as Lonesome George, died 16 years ago aged 101 or 102. A few weeks ago the World Wildlife Fund (WWF) published its biannual Living Planet Report — the 12th such report, and the grimmest yet. The world has lost 60 per cent of its wildlife (vertebrates) in the past 30 years and seen an 83 per cent decline in freshwater species. It all makes for very grim reading. But if reading is what you want, there’s plenty of it out there. A cursory search on the British Library shelves throws up books about specific species — The Last Panda by George Schaller (1993), Tigers in the Snow by Peter Matthiessen (2000), Tony Juniper’s Spix’s Macaw (2002) — or groups like Chris Cokinos’s Hope Is the Thing with Feathers: A Personal Chronicle of Vanished Birds (2000) and William Stolzenburg’s poignantly titled Where the Wild Things Were: Life, Death, and Ecological Wreckage in a Land of Vanishing Predators (2008). Then there are others with a wider remit, such as Diane Ackerman’s The Rarest of the Rare: Vanishing animals, Timeless Worlds, David Quammen’s The Song of the Dodo, Thom van Dooren’s Flight Ways: Life and Loss at the Edge of Extinction and Elizabeth Kolbert’s The Sixth Extinction: An Unnatural History (2014). Not to mention Ursula Heise’s excellent Imagining Extinction (2016) from which this very partial list is taken. There’s plenty to despair about and rail against. Last Saturday, I stood in Parliament Square for the second Extinction Rebellion (XR) demonstration, joining in the non-violent civil disobedience uprising that has suddenly mushroomed in the wake of the WWF report, and the UN Intergovernmental Panel on Climate Change (IPCC) report, published last month, which warned that we have 12 — yes, you read that right — 12 years to not reverse or stop global warming (we’re already beyond that) but even just to limit it to 1.5 degrees. The window of opportunity is little more than an arrow-slit and is closing fast. I recently attended a conference called New Networks for Nature, where urgency and passion were evinced in equal measure. Not one but two speakers had to stop mid-sentence to collect themselves, on the unexpected brink of tears. Mark Cocker was one, whose most recent book Our Place has a (publisher-imposed) subtitle, that kind of says it all: Can We Save Britain’s Wildlife Before It Is Too Late? Is it too late? The answer, for many, many species, is yes. In a second-hand book shop a few months ago I picked up a battered hardback. 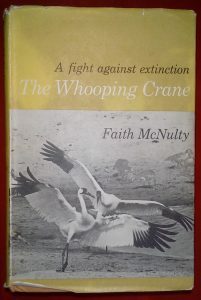 Faith McNulty’s account of the fight to save the whooping crane from extinction was absolutely gripping — a real page-turner. When conservation efforts started in the 1930s there were thought to be less than 15 individuals left. By the time the book was published in 1967, two years after I was born, the numbers had crept up to 36 adults and eight young: They were hanging by a thread. It took me several weeks after finishing the book to gather the courage to find out what had happened since then. Did they survive? Or had the Grus americana, America’s tallest bird, followed the dodo over the cliff-edge? November 30 is marked as Remembrance Day for Lost Species. In rituals and events around the world, people will gather to mourn, and to bear witness to what is now widely accepted as the sixth mass extinction event on the planet, and the first to be caused by one species: Us. The list of the dead is growing at a calamitous rate, and those — like the whooping cranes — that are teetering on the edge are even more numerous. The species listed as endangered on the International Union for Conservation of Nature list include one in four mammals, one in eight birds, one third of all amphibians and 70 per cent of the world’s assessed plants. There are 800 whooping cranes on earth today, thanks to the heroic efforts of many dedicated humans. It isn’t enough, of course. But in a world currently going through ‘the great thinning’ (as author Michael McCarthy terms it), it is something to be grateful for, a moment of joy.